Hip, hip, hooray--it's time to graduate from the highchair to the big kid's table! Your little is eager to be a big kid (just like you! ), but can't quite reach the table without a little boost. 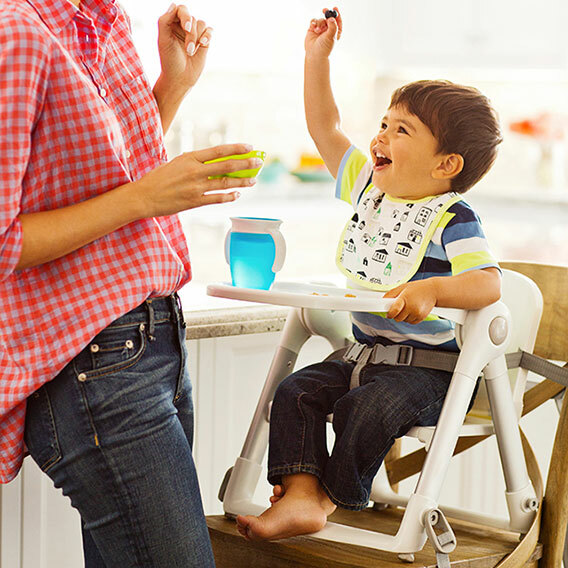 Transition to the table easily with Munchkin's compact and portable booster seat, Boost™. An easy-push button makes set-up quick and simple, plus it folds flat so you can take it with you when traveling, eating out, or store it when not in use. The removable tray allows you to use this as a booster or a dining chair. You can also rest easy knowing your child is safe with Boost™'s non-slip feet and adjustable straps, both ensuring a snug and secure fit on most dining chairs. Your little diner can't wiggle out of the chair either with our secure 3-point harness system--let's eat!